I had a fridge full of leftovers and nothing for dinner. 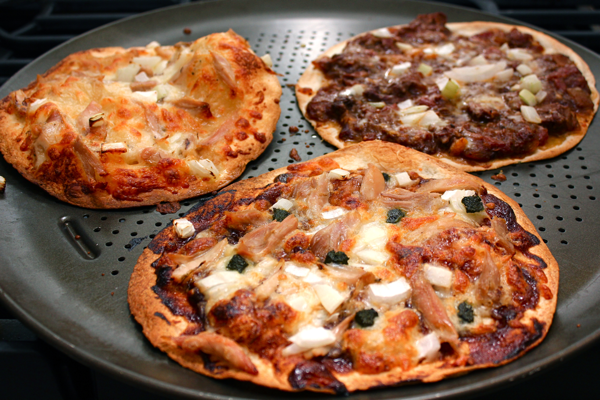 So I made the thinnest-crust pizzas using… FLOUR TORTILLAS! I love thin-crusts, and the tortillas toast up to be bubbly and cracker crisp. They taste like a better (healthier) version of Domino’s thin crust pizzas. We LOVED them. I wish I had made three more. To make your own, preheat the oven to 400ºF. Top your tortillas however you like- get creative! I made one BBQ chicken pizza (BBQ sauce, mozzarella cheese, chicken, onions, and cilantro) and one pizza topped with leftover chipotle beef, onions, and cheddar cheese. I’ll save the third pizza toppings as a surprise for another day. Bake the pizzas for 10 minutes until the cheese begins to brown and the tortillas are crisp and puffed. Slice them up and enjoy. 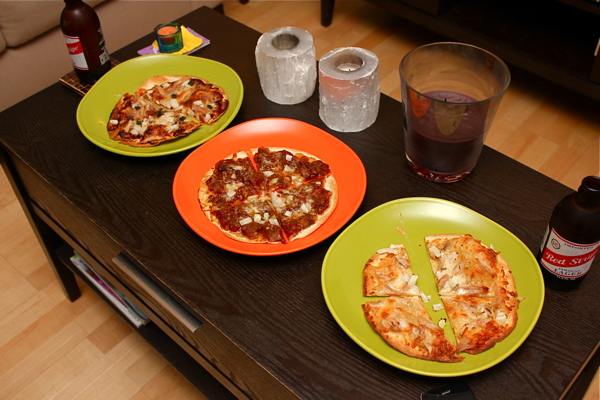 These pizzas are great to eat while watching sports. And drinking beer. I love thin crust pizza so I’m definitely going to have to try this. Thanks for a great idea!